Nootropics are substances that improve mental functioning, like increased information processing, concentration, memory, mood, or some combination of cognitive benefits. We’re going to review the best nootropic stacks on the market. Who is Qualia Especially For? Who is Alpha Brain Especially For? Who is CILTEP Especially For? So What is the Single Best Nootropic Stack? Nootropics is essentially a fancy word for cognitive enhancers or smart drugs. But there’s an important distinction to make between “smart drugs,” which are generally synthetic substances manufactured in labs, and nootropic supplements. Nootropic supplements are substances derived from nature that possess cognitive benefits. Many of these substances have been used for thousands of years in Ayurvedic medicine, Chinese medicine, and other ancient healing systems. If you’re interested in learning more about nootropic supplements and reviewing my recommendations based on clinical studies, see this nootropics supplement guide. A nootropic stack is a combination of two or more nootropic supplements taken together or in a sequence to create specific cognitive benefits. For example, you might take one nootropic supplement to improve your focus and another to enhance your memory. In this guide, we’re going to review the best, preformulated nootropic stacks. Let’s examine what’s inside each of these best nootropic stacks and review their benefits. Developed by the Neurohacker Collective, Qualia Mind has seen several iterations. Qualia features nootropics like caffeine, L-theanine, and 21 other powerhouse substances. Out of the fast-growing community of Nootropic consumers, Qualia has emerged with a reputation of being one of the best nootropic stack available on the market. And I agree with the evaluation: Qualia is the best all-in-one nootropic stack. I’m actually on it right now as I write this. Effects last up to 6 hours with a single dose. Your level of sensitivity will determine how you perceive the effects. I notice a slight buzzing sensation toward my prefrontal cortex. This buzzing sensation is similar to what you might experience on caffeine but without any jitters. Plus, this sensation coincides with a marked clear-headedness that enables prolonged focus. If you notice that you tend to get distracted easily or lose focus on an important task, Qualia Mind can help you zoom in and get things done! What makes Qualia one of the best nootropic stacks? Qualia Mind has an innovative mega-blend of 22 ingredients that fall into different classes of components that make its performance effective and long-lasting. Nootropic Compounds: Primarily responsible for improving cognitive brain functions. Qualia Mind has eight compounds which consistently provides consumers with a strong base for higher mental performances and enhanced productivity over time. Neuro-Vitamins: Our nerves and nervous system require a steady supply of neuro-vitamins during peak working hours. These added ingredients ensure they are continuously being replenished. Antioxidants: Provides cellular repair and reduce the effects of deterioration, slowing down the chain reaction initiated by highly reactive free radicals produced inside the human body. Adaptogen Extracts: Enhances the longevity and vitality of human cells. Qualia Mind has 10 different extracts which promote longevity and raise energy levels over a period of time. Amino Acids: Amino acids are substances which are building blocks of life. Neurotransmitters used in coordinating cognitive brain function are created and repaired with amino acids. Choline Donors: A special type of neurotransmitter that governs neuro-motor functions and connections. Acetylcholine is responsible for maintaining the specific percentage of choline, allowing the brain to communicate more fluidly with your body. Like all of the best nootropic stacks, Qualia Mind targets high-performing individuals, including entrepreneurs, executives, and creative professionals looking to upgrade their brain power for sustained thinking and knowledge work. Efficacy: Every human being is biologically unique and optimum dosage depends on your weight and sensitivity. So, as with any nootropic stack, experimentation is necessary to find the optimal dosage. 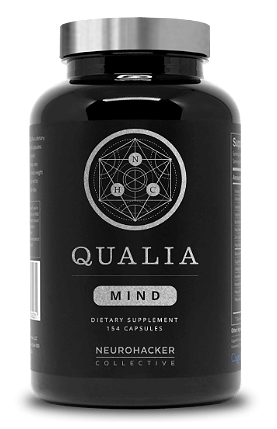 Many well-known biohackers consider Qualia Mind to be the industry-leading nootropic stack. Potential Side Effects: A small minority of consumers have reported a mild upset stomach. The Neurohacker Collective suggests taking Qualia after breakfast if this occurs for you. Begin with a single stack and gradually working towards combing two more in their daily routine. Dosage should never exceed 10 capsules at once or more than 12 in a day. Qualia is designed to yield best results with “ON-OFF CYCLE”. It is recommended to consume for 5 days a week with a break of 2 days period. Suggested Dosage: Take 7 capsules with water before breakfast. Special Offer: Use code “CEOSAGE” at checkout to get 15% off. 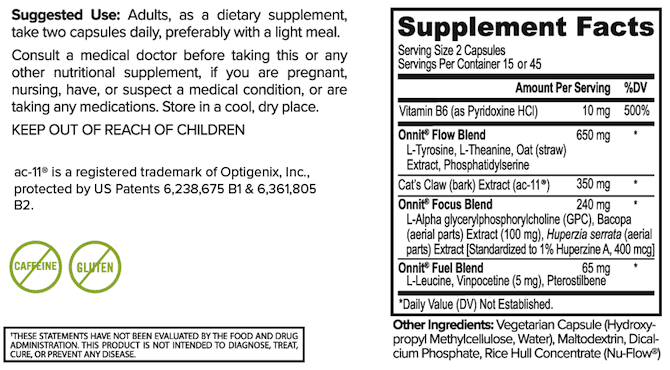 Produced by ONNIT’s Lab since 2010, Alpha Brain is definitely one of the best nootropic stacks available. AlphaBrain doesn’t include even traces of caffeine or artificial stimulant, which is beneficial for those who try to avoid stimulants. Loss of concentration and mental abilities due to normal aging can indeed be reversed. Boosts energy, alertness and memory. Improves mental speed, in response to stimuli. Huperzia Serrate Extract: Huperzia serrate, also known as Huperzia A, raises Acetylcholine, a chemical used as a transmitter between the neuron (neurotransmitters). Huperzia A plays a crucial role in signal transmission, which deals with the encryption, storage, and retrieval of memory. Bacopa Monniera: A neural tonic and memory enhancer widely used in treating Parkinson’s disease, epilepsy, and attenuation old dementia. 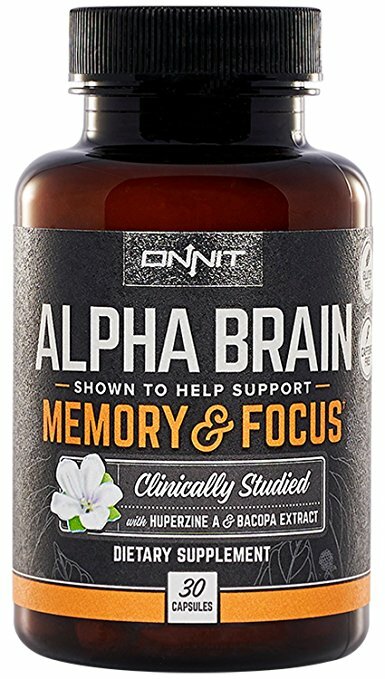 Bacopa is one of my favorite nootropic supplements, but Alpha Brain only provides 100 mg, which isn’t the optimal dosage (600 mg). L-Alpha (GPC): A special form of chorine, effectively used to enhance memory power, cognitive ability and mental focus on different tasks. L-Tyrosine: Our brain, adrenal glands, and other organs use this amino acid to make neurotransmitters which are important for mood balance and normal behavior especially under stressed conditions. Vitamin B6 (pyridoxine HCl): Important for proper brain functioning and key neurotransmitters that regulate sleep cycles and alertness. Mild deficiency of Vitamin B6 leads to poor sleep, changes in behavior, and loss of hypothalamus-pituitary control of hormone secretion. Efficacy: Two randomized clinical studies support the efficacy of Alpha Brain to improve verbal recall, enhance executive function completion time, increase processing time, and more. Potential Side Effects: No harsh effects have been noted. A few customers report nausea, headaches, and upset stomachs. According to a survey, some users say they don’t experience any benefits. For beginners, dosage should be according to directions. Maintain ON-OFF cycling for better performance. Dosage should never exceed 2 per day. Suggested Dosage: 2 capsules with a light meal. CILTEP is an acronym for chemically-induced long-term potentiation. Developed by Natural Stacks, it’s widely used and is currently amongthe best nootropic stacks. This nootropic stack aims to heighten your level of concentration, focus, and memory function. The key feature of CILTEP is its ability to stimulate the brain to enhance your hippocampus (associated with memory). CILTEP is designed to induce long-term potentiation (LTP) in the brain, which is crucial to developing and stabilizing of new memory. Another key feature is CILTEP’S ability to strengthen neural synapses, allowing signals to move faster across synapses. Faster connections provides a tremendous boost to your coordination and mental functions. Artichoke Extract (AE): AE contains Luteolin, a natural inhibitor of PDE4. PDE4 is an enzyme that breaks down cAMP molecules, messenger systems that relay signals in the brain. Studies correlate lower levels of the enzyme PDE4 to significant increases in mental performance, including increased cognition, improved long-term memory, enhanced wakefulness, and neuroprotection. 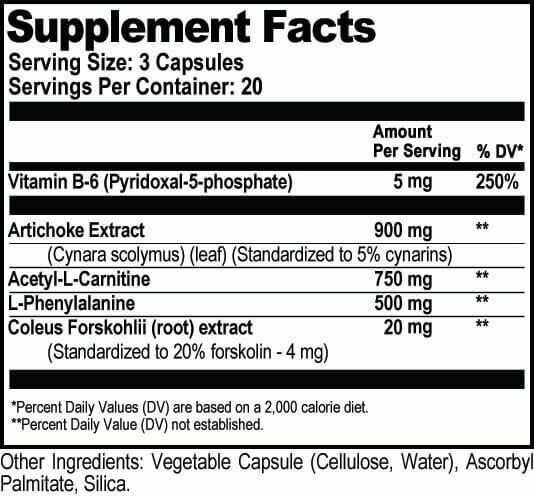 Forskolin: Derived from the plant Coleus forskohlii used in traditional Ayurvedic medicine, Forskolin has also been studied due to its ability to increase levels of intracellular cAMP molecules. Combined with Luteolin from Artichoke Extract, forskolin is believed to synergistically increase the duration of cAMP in neurons. Acetyl-L-Carnitine (ALCAR): ALCAR is an acetylated form of the amino acid L-Carnitine that has been shown to cross the blood-brain barrier. Known for its roles in energy metabolism and mitochondrial protection, the addition of ALCAR to the CILTEP formula helps combat feelings of brain fog and fatigue. L-Phenylalanine: L-Phenylalanine is an essential amino acid which can be found in protein-rich foods like eggs, spinach, meat and other leafy greens. It’s a basic building block for the neurotransmitter dopamine. Vitamin B6: B6 is an important enzymatic cofactor in normal metabolic and psychological functioning. CILTEP includes Pyridoxal-5-Phosphate, a metabolically active form of Vitamin B6 for optimal bioavailability. Taking CILTEP in the early morning may yield enhanced mental activity for 4 to 8 hours. This nootropic stack helps you stay mentally engaged for studying, analysis, research, etc. Efficacy: I haven’t seen any clinical studies, but the overwhelmingly positive reviews in the nootropic community point to the efficacy of CILTEP. Potential Side Effects: Some users report having difficulty sleeping when they take this best nootropic stack too late in the day. CILTEP was developed over years of extensive research, resulting in a PATENT (U.S. Patent 9,149,457). Suggested Dosage: 1-3 capsules per day. The best timing for intake of CILTEP is early morning on an empty stomach. Some users optimize this nootropic stack by combining it with caffeine. Qualia Mind comes with more capsules which lasts up to 22 days. It’s the most expensive nootropic stack (each cost of serving $4.04) of the three. Alpha Brain has 90 capsules in the pack, which run up to 45 days and is a more economic option. CILTEP comes with 60 capsules in the bottle, priced at $42.95 and lasts for only 20 days. 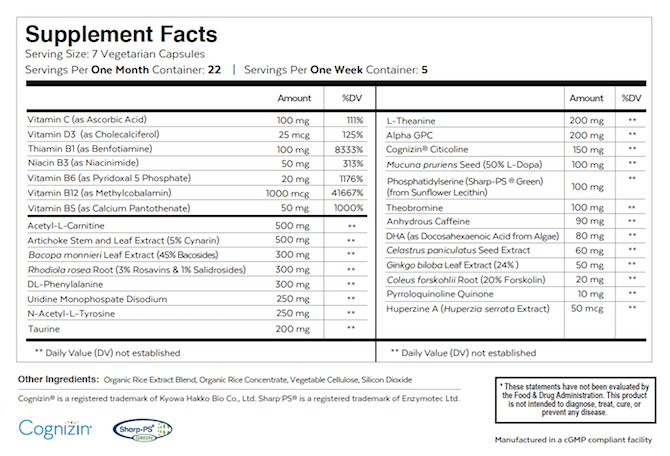 While Alpha Brain is the least expensive per dosage, I still believe Qualia Mind is a superior product. While both nootropic stacks have an insufficient dosage of Bacopa, Qualia Mind has three times more than Alpha Brain. Of the three nootropic stacks, I recommend experimenting with Qualia Mind first. Yes, it’s the most expensive, but for a good reason. Take it for five days as directed and see for yourself. My second best pick is Alpha Brain, followed by CILTEP. But ultimately, because each of our biological makeup and needs are unique, experimentation is required. The best nootropic stack can easily vary from person to person. Regardless of which nootropic stack you choose, be sure to practice cycling. Allow your body to rest at least two days without taking your nootropic stacks.